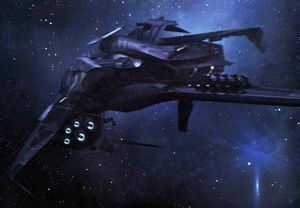 The UNSC Dusk is a UNSC Navy prowler assigned to the UNSC Home Fleet during the Human-Covenant War. Unlike most prowlers, the Dusk is manned and operated by regular naval personnel rather than by the Office of Naval Intelligence. Prior to the Battle of Earth, the Dusk had seen eighteen months of constant action. The Dusk was in Earth orbit when the Battle of Earth occurred. It was caught between rotations and was forced to engage with only 43 members of a normal complement of 90 crewmen. When the UNSC In Amber Clad pursued the Prophet of Regret's assault carrier, Solemn Penance, the Dusk was one of four ships with charged slipspace capacitors that was fast enough to follow. However, only the Dusk was able to catch the slipspace wake caused by the carrier. Its companions, the UNSC Coral Sea, the UNSC Paris, and the UNSC Redoubtable, moved farther ahead in the slipstream, losing contact with the Dusk. Upon exiting slipspace, the Dusk deployed several Hornet mines. The prowler watched over a hundred Covenant ships and High Charity over Installation 05, as the Great Schism had began. The Dusk hid in the shadow zone of Opusculus, the moon of Substance, as the prowler recorded the battle. After observing the Second Fleet of Homogeneous Clarity destroy itself, the Dusk returned to Earth via slipspace. Upon returning to Earth, the Dusk was caught in the space battle unfolding in orbit. It was soon redeployed to Onyx in support of Battle Group Omicron, following the reception of a distress signal from Dr. Catherine Halsey. Soon after arrival, Battle Group Omicron engaged a Covenant fleet, led by Fleet Master Voro Nar 'Mantakree. Rather than directly participating in the battle, the Dusk laid several HORNET Mines, destroying many Covenant vessels. After the battlegroup succeeded in destroying twenty Covenant vessels, additional Covenant vessels soon arrived, destroying every ship in Battle Group Omicron with the exception of the Dusk. The crew of the Dusk witnessed the remaining Covenant ships being destroyed by Sentinels, then returned to Earth. The prowler survived the war, and its battle records was later examined by the Office of Naval Intelligence. Captain Iglesias — Former commanding officer; undergoing treatment at the time of the Onyx Conflict. ↑ The design of the Dusk, in particular the "tail", matches that of the UNSC Port Stanley, a confirmed Sahara-class prowler. Its body and superstructure designs also match those of the UNSC Aladdin, also a Sahara-class prowler.